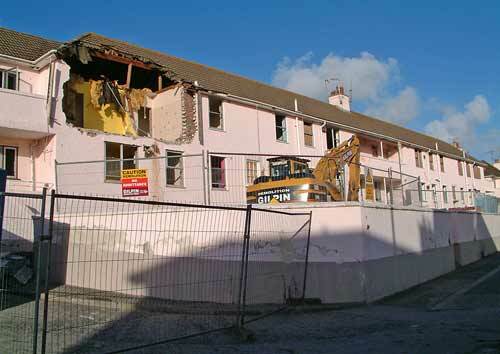 The first two photos below show Mount Street prior to its demolition in November 2002. 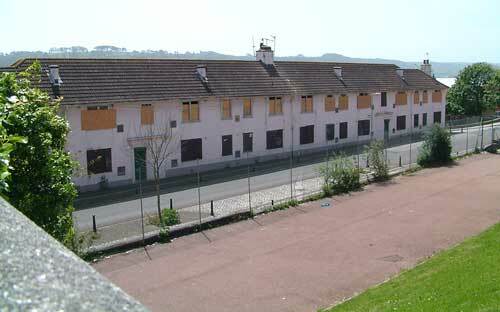 These terraced properties were built as council homes in 1939 and now, more than 60 years later, were condemned as unfit and boarded-up ready for demolition, with tenants rehoused elsewhere in Devonport. 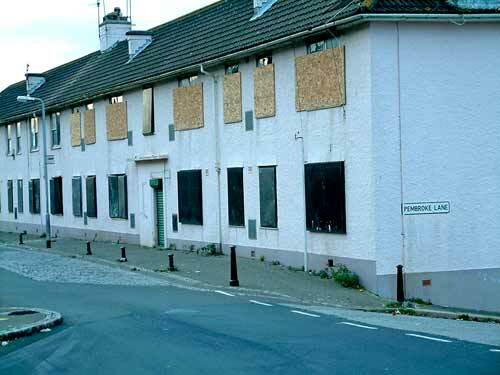 Boarded properties such as this was a common site in Devonport during the decade 2000-2010. Above: Two views of the same end of Mount Street (next to the school) before demoliton. 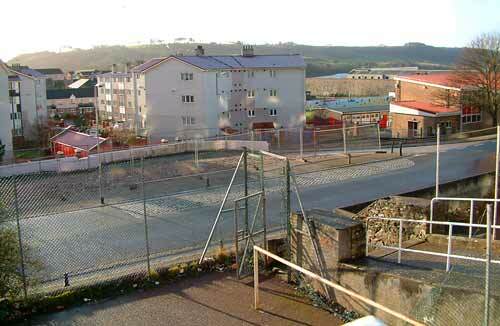 Below: The same end of the street after demolition. The tree at right has lost its leaves and the school is visible. [snip ....] After lunch the sun had started to come out - I went to Mount Street for the demolition. Jeanne Flynn arrived, then Mrs White with her family (daughter, son in law and grand-daughter). Mrs White said she was was the first resident to move into Mount Street when they were built, back in 1939. (having come up from John Street in Morice Town, one of 13 children). She lived in flat 1B Mount Street, a three bedroomed home and her weekly rent then was 6/6d (six shillings and six pennies in pre-1972 currency, equivalent to 32 pence in 2012 currency). 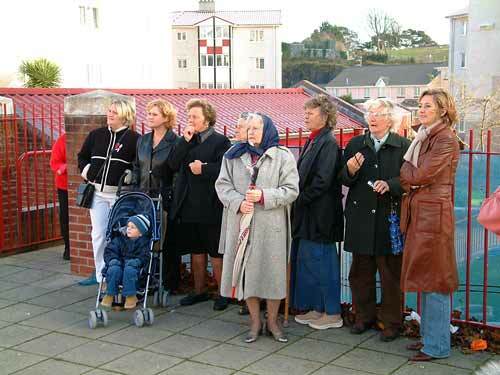 Her daughter and granddaughter (Tracy Gawmon), who are in the photos with her, were both born in flat 1B. I asked Mrs White how she felt about watching her home for nearly 60 years being demolished. She said ”Very sad, its terrible”. Mrs White only moved out about four years ago. At one time she had bought the house from the Council, so sold it back to them when she left. 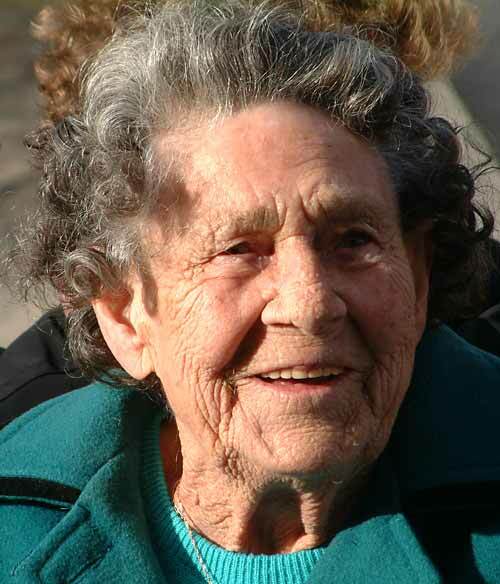 She is 89 now and lives with her daughter Mrs Gawron (sp) at Weston Mill. The lady with pale coat who joined the group later is Mrs Hamilton, (I think her first name is Norah?) Norah once lived up over Mrs White, in flat 1D Mount Street, having moved in there as a child with her parents back in 1948. Mrs White said that when she (meaning her friend Mrs Hamilton) got married from Mount Street it wasn’t very popular as she was the first woman in the area to marry a black man – nowadays she says it is common, but not then. Barbara and Harry Wilkinson then arrived to watch the demolition – they now live in Clowance Lane next to Winnie Parsons, who also watched the demolition. Barbara and Harry lived in Mount Street, flat 8B, for more than 25 years. The next set of photos were taken from the rear of Mount Street, in Pembroke Lane, which is where everyone stood to watch the demolition begin. 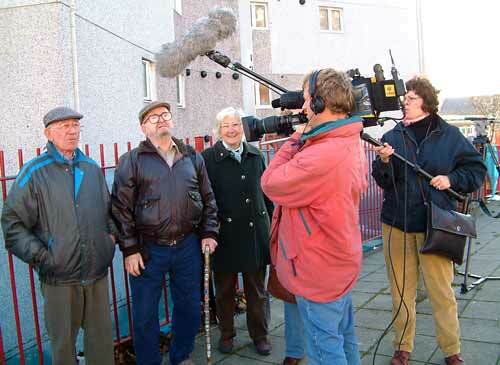 Left to right: Mr Banister, Harry Wilkinson, Winnie Parsons, cameraman, Zoe the BBC producer. 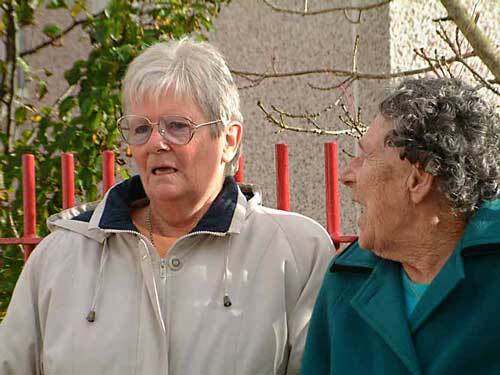 Friends and one-time neighbours Norah Hamilton left and Mrs White at right. Above, I took this photo of Mrs White while she was being interviewed by the BBC team that day. I didn't own a proper video camera at the time of Mount Street demolition, but managed to take a few minutes of moving film with my stills camera; the quality is low but I'll try to include here shortly. Work was scheduled to begin within seven years. Around demolition time the Urban Village office at George Street set up a poster competition, to encourage residents to supply their views on how to use the site, during the seven years. A view of Mount Street at February 2003, taken from the George Street end. 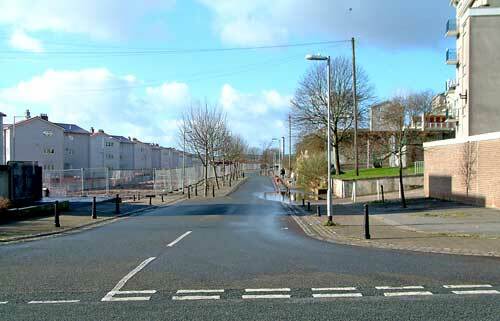 In the Devonport Regeneration Company Board Minutes of 19 August 2003, section 7.2 contained the following statement " Mount Street Steering group has selected City Landscape Service. Work is progressing." 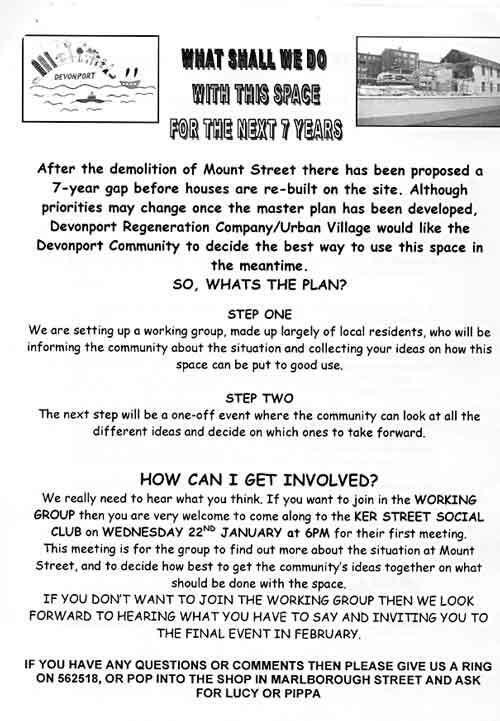 But, in the Devonport Regeneration Company Environment Minutes of October 2004 was the statement "The temporary landscape works at Mount Street are still subject to ongoing discussion and the timetable remains unclear." At time of writing, March 2012, the plot is still barren, that's almost eleven years. During that period, various developers/contractors have placed wire cages around the site and stored their property there. 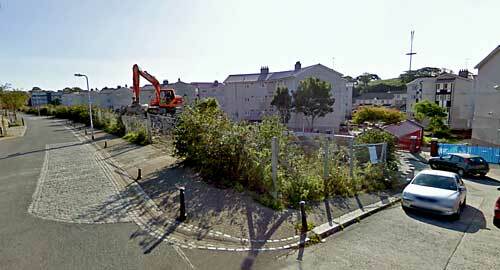 This Google image downloaded at March 2012 shows plant life and shrubs growing wildly on the plot, with machinery still being stored there by builders. Mount Street is the road to the left, Pembroke Lane is the short section leading down right. - the same position as per the first image at top of page.